Robert Sheehan wears black high top Converse “Chuck Taylor” All Stars in the film. Vincent and his father, Robert, don’t agree on how to deal with his Tourette Syndrome in The Road Within. Bringing an interesting, yet albeit well used flair to the “dramedy” genre, The Road Within attempts to offer a unifying message through uncommon tropes. A shot-for-shot remake of the German film Vincent Wants to Sea, Gren Wells’ directorial debut seeks to offer a more melancholy take on the coming-of-age tale. Solid performances by a well-rounded cast ultimately fail to save a formulaic picture. With that said, the characters’ unique quirks may come off as off-putting at first, but ultimately come to be strengths. Dr. Rose brings Vincent to his new room at the behavioral facility. Vincent (Robert Sheehan) is a young man dealing with a particularly abrasive form of Tourette Syndrome. His sudden outbursts and twitches have become too much for his father (Robert Patrick), who enrolls him in a behavioral facility following his mother’s funeral. There, he rooms with Alex (Dev Patel), a germaphobe with a severe case of OCD. He meets his doctor, Dr. Rose (Kyra Sedgwick) and a mysteriously melancholy girl named Marie (Zoe Kravitz) who is anorexic. After being scolded by Dr. Rose for attacking a boy who taunted him by filming his outbursts on a cell phone, Vincent grows tired of the facility. He and Marie hatch a plan to get out, and Marie steals Dr. Rose’s car keys. While leaving, Alex attempts to rat the two out and they forcefully bring him along. The trio decides to head to the sea, and ultimately settle on the beach town of Santa Cruz while Dr. Rose and Vincent’s father chase after them. Alex, Vincent, and Marie go on an unlikely road trip to the California coast. Sheehan, Patel and Kraviz are quite good as the odd-begotten trio of the film. All three of their so-called “problems” are presented in ways both to evoke laughter and empathy. With the portrayal of mental illness in film, many seek to take a more serious tone. This film expertly balances scenes where the harmful effects of such problems are manifested and felt, but also where they can be cause for a good laugh or two. The chemistry between the three is seen and felt, and Vincent and Marie’s romance is a believable one. Robert Patrick does a solid job as Vincent’s father, who undergoes a significant transformation throughout the film. Vincent and Alex at Yosemite National Park. The likability of the characters does ultimately save The Road Within from succumbing to a formulaic story. The coming-of-age film tropes are all present, as the characters’ journeys undergo typical twists and turns. There are light moments, followed by low ones, and ultimately realizations and revelations about life are made. Nothing new is presented here, which is sad due to the performances of the actors. Breaking even one or two of the typical genre plot arcs would have served the story much better, and added a surprisingly real lesson to be learned. Vincent and Alex eventually become good friends. Vincent and Marie are attracted to each other. Chucks are well represented in the film. Vincent sports a rather well worn pair of black high-tops throughout the movie. 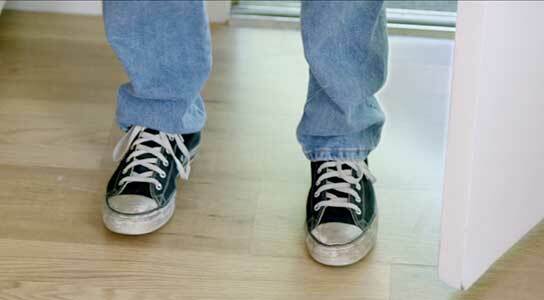 One memorable scene involves Vincent and Alex’s first meeting, as Alex notices the dirty chucks right away. Not surprisingly, he freaks out and immediately demands that Vincent take them off at once. When Vincent first enters his new room at the behavioral facility, the camera pans up his black high top chucks as Alex demands he take them off. The Road Within. (2014) Robert Sheehan, Dev Patel, Zoë Kravitz, Robert Patrick, Kyra Sedgwick. Written and directed by Gren Wells. Categories: Drama, Comedy, Coming of Age.